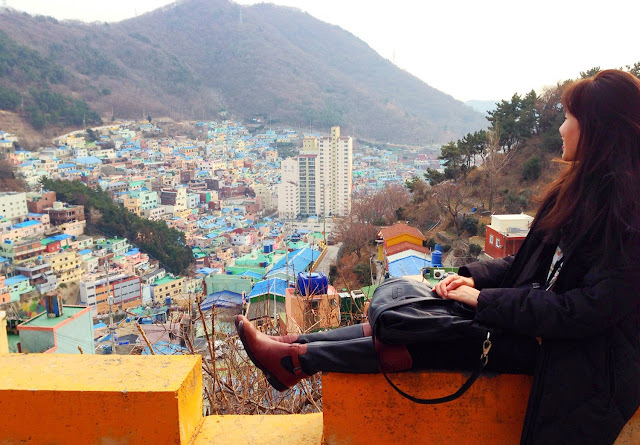 Five hours away by bus from Seoul is Busan, South Korea's second largest city, famous for its beaches and summertime fun. Now, being that I visited in the beginning of January, the beach wasn't exactly the most ideal spot to chill in Busan. 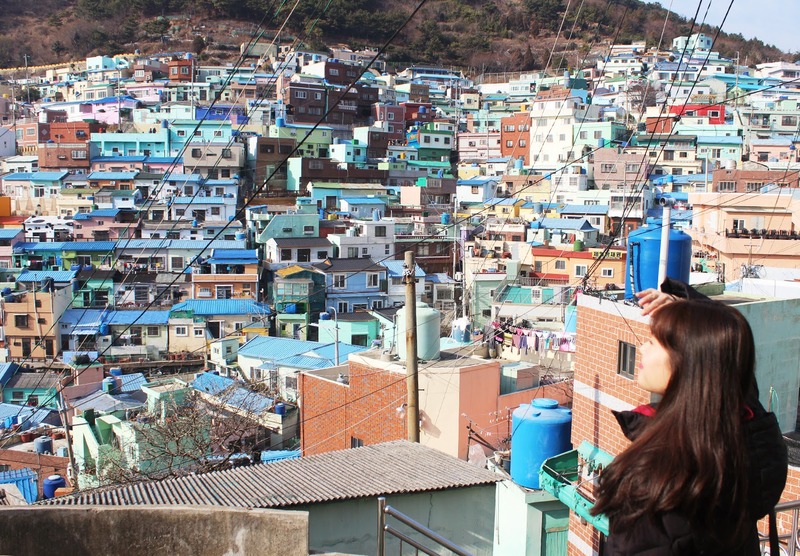 On our first full day in the city, my friends and I rode a speedy minibus which expertly zigzagged us up the hills of Busan to Gamcheon Village. The picture above was taken after maybe an hour of making our way through the nonsensical streets and stairs of the village to the topmost peak. But before all that hiking, we filled up our bellies with delicious pork broth, rice and an array of fresh Korean side dishes. 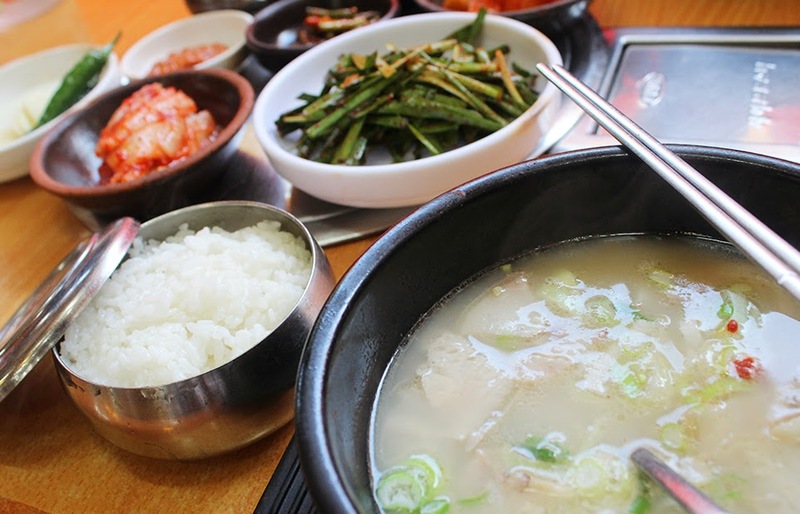 After this trip, I think I will be craving Korean broths every winter. The light soup was flavorful and perfect with slightly sticky Korean rice and little salted raw fish added a hint of salinity. So simple yet so tasty. Another interesting thing was that the restaurant we had this in was one where you take off your shoes at the entrance and you sit on a mat on the floor. It was pretty cool the first few times we had to do this at certain places but after awhile, it gets a bit tedious. After lunch, we began our trek through the streets of precariously perched homes in search of whimsical street art and evidence of what everyday life is like for locals. Stray cats were common in Gamcheon and I loved this particular one who sat so still, watching what the old lady was cooking up. Busan seems like a more laid back, rustic place than Seoul. Here's another look at the mish-mash of buildings that seem to defy physics. We were so lucky that the sun was shining brightly and there wasn't a drop of precipitation in sight. I have no idea how locals get anywhere when it snows or rains! 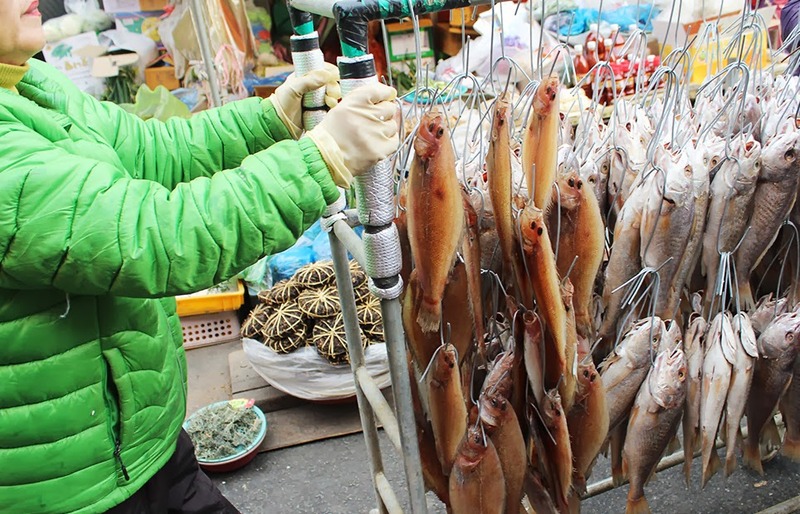 Jagalchi Fish Market is a must see if you're in Busan. 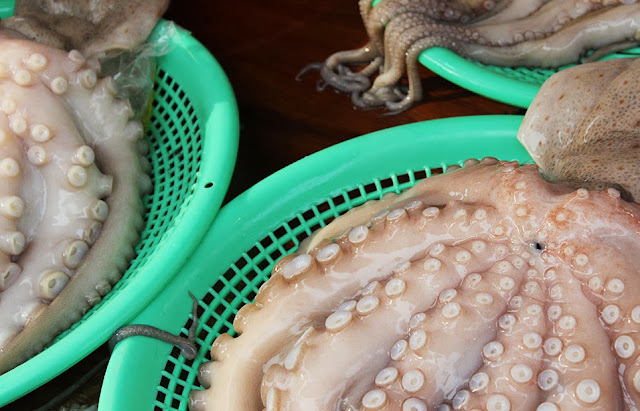 I love seafood and it was so fun to see every kind of edible under water creature within arm's reach. The market is essentially a long street with vendors on either side of you. 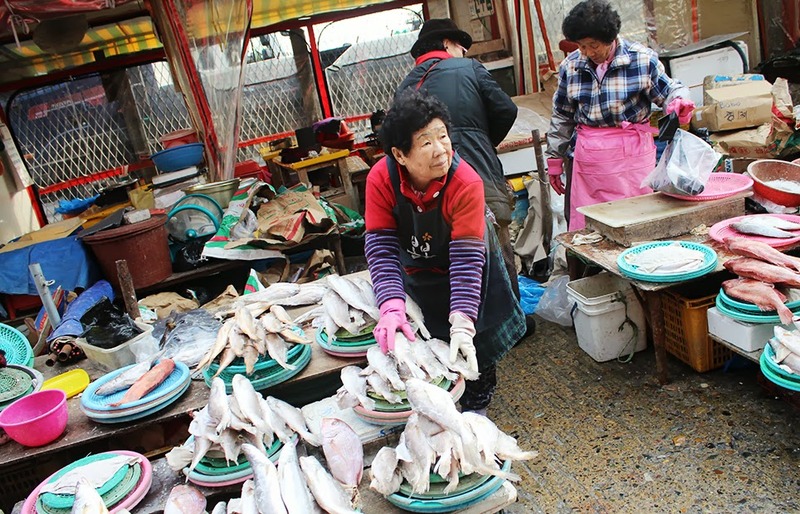 There are lots of "ahjummas" (old ladies) who sell fish, both raw and cooked, clams, squid, anchovies, and everything else you can imagine. 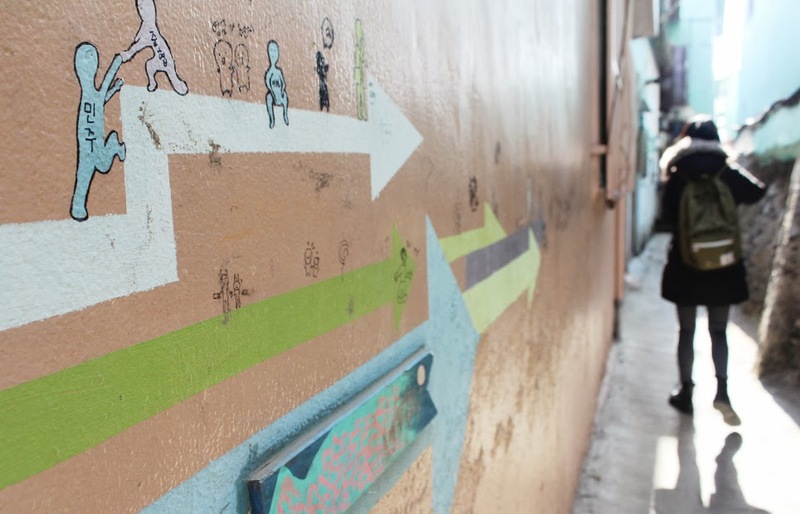 There isn't much space to dilly dally because you'll be moved along with the current of tourists and shoppers. For dinner one night, we had a seafood "jigae" (stew) with clams, octopus, conch and crab. 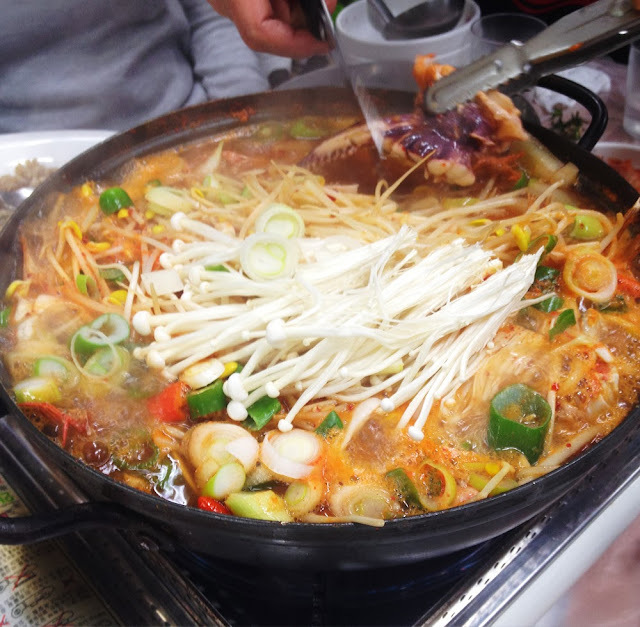 The broth was really spicy but so perfect with white rice and some "pajeon" (Korean pancake). On the day we went to Haeundae Beach, it rained. Out of our two week trip, it only rained that one day. Which I guess is a good thing to have had really good weather for the other days but it was really ironic that our beach day was the absolute worst day weather-wise. 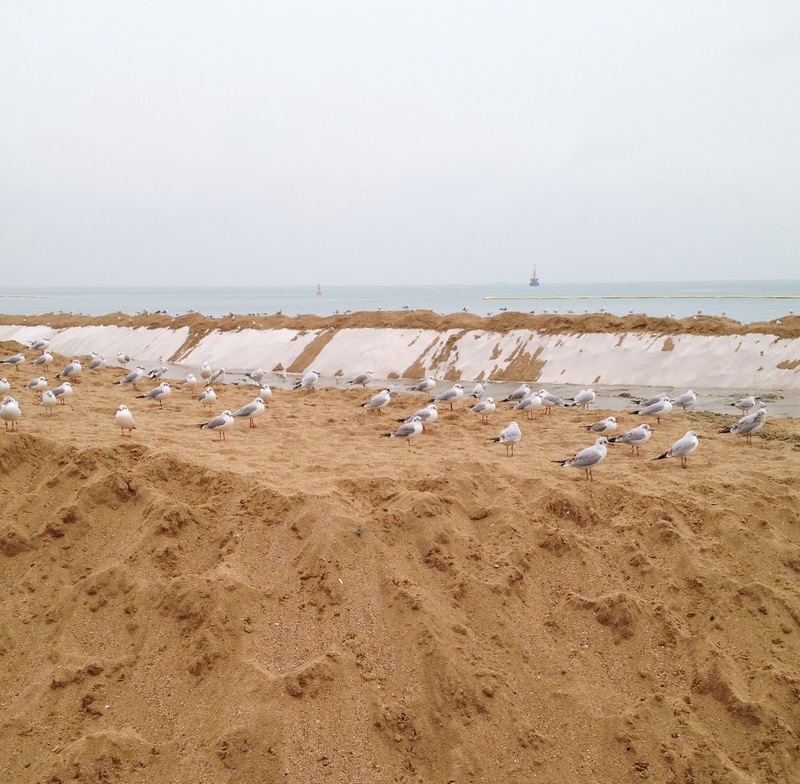 They were landscaping the beach so the sand was all dug out and seagulls were everywhere waiting for some small fish or bugs to turn up. A great way to get out of the dreary weather if you're in Korea is to visit a "jjimjilbang" (spa). We actually went to Spa Land in Shinsegae Centum City on our first night in Busan. After a five hour bus ride, we just wanted some r&r. Shinsegae Centum City is the largest department store in the world and it's like Saks, Barneys and insert-pricey-department-store-here had a child. 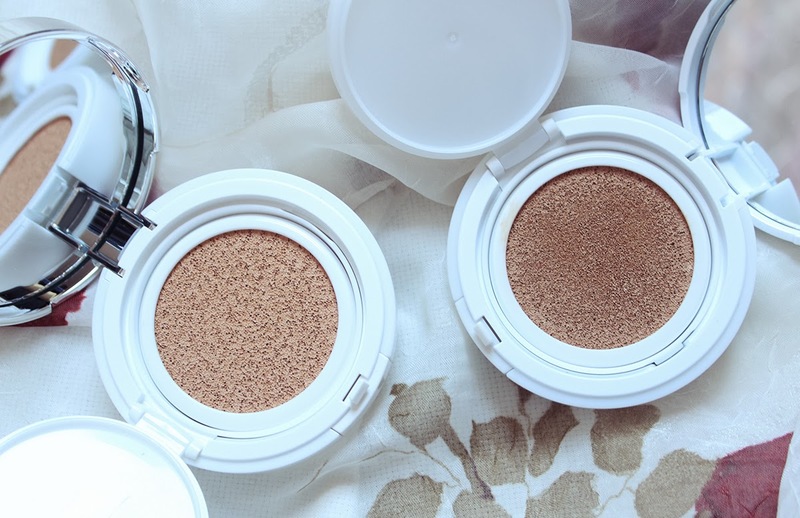 We walked through the immaculate beauty department to get to Spa Land and I was in heaven. 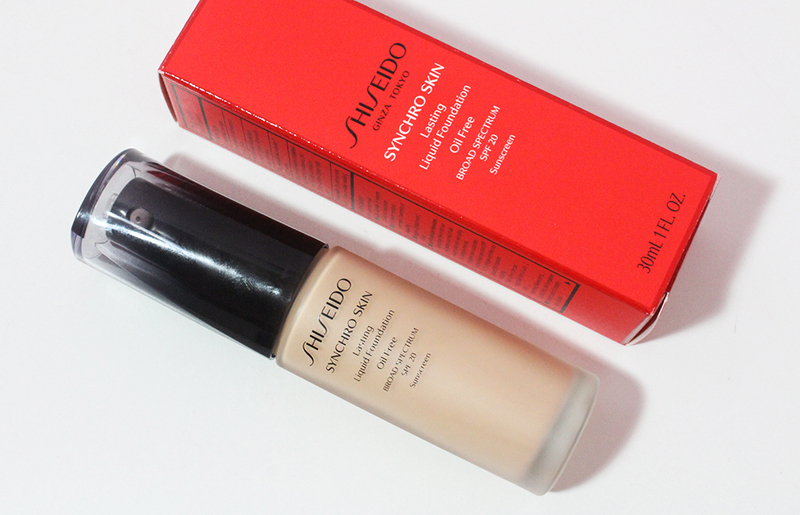 Unlike normal jjimjilbangs which are usually free for all day usage and open to all ages, Spa Land has a four hour time limit and children under 12 are not permitted. After 8 P.M., the price of admission is only ₩8000 and the highest cost is ₩14000 for adults on weekends. So the price is very inexpensive for the quality of the facilities! Everything was clean and modern looking and even though we went at 8 P.M. with reduced pricing, it wasn't crowded at all. 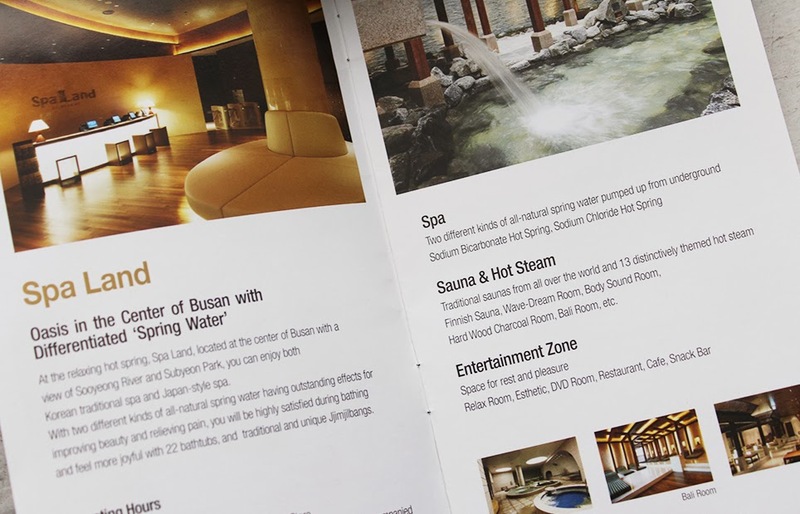 On another day in Busan, we visited the spa inside Nongshim Hotel and it was more of a traditional jjimjilbang in that you could stay for however long you liked and little children were running around. 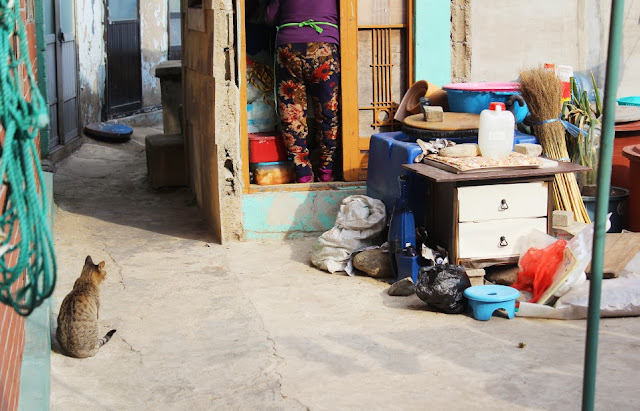 But the facilities were noticeably older and more worn. The water smelled a little weird and overall, the experience was much less glamorous and pampering than at Spa Land. 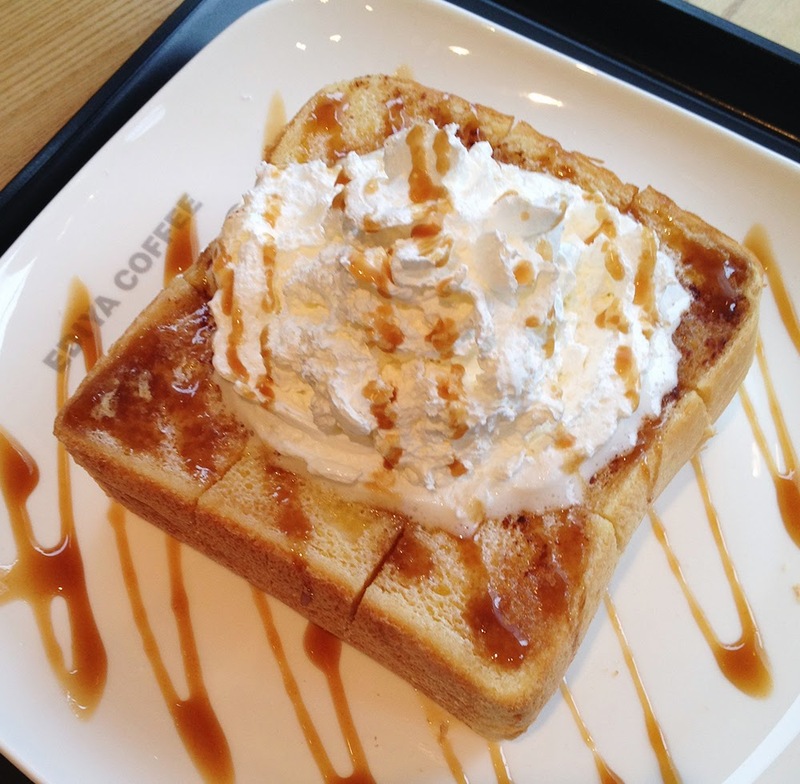 I'll leave you with a picture of the thick caramel toast from Ediya Coffee, a cafe chain akin to Starbucks. My friend loves Ediya for their reasonably priced green tea lattes and she got us all hooked on Ediya as well. It's a great place to stop and have a warm drink if you've been roaming outside all day in the freezing cold. I tried a few of their drinks and their sweet potato latte was definitely the most memorable! Stay tuned for the third part of my Korean travels! I'll be taking you with me to Jeonju next!